The finals days of Spring Training are upon us. MLB clubs are finalizing their regular season rosters and the cold weather cities await the hope that baseball and (eventually) warm weather might bring. Here in Florida, it gives many of us relocated Northerners a final glimpse at our teams before they depart for Opening Day. Although I was able to catch my Tigers team in action three times this Spring, it still feels like I missed out on things. Sure, the expectations for the club are among the lowest in MLB, but there are still plenty of storylines and areas of interest to keep a dedicated fan busy. Those early practices days in mid to late February are certainly worthy of more of my attention. There’s always next year. First, baseball fans are loyal. When you consider that NFL Training Camp is held in close proximity to their franchise’s home city, baseball fans are willing to travel over a thousand miles to watch their teams prepare for the upcoming season. There simply is no equivalent in sports. Fans from many cold weather cities will escape the harshness of winter and build their travel plans around checking out their squad. Second, baseball is truly a multi-generational game. It is often said that baseball is one of the few things in modern American life that has the capacity to connect the generations. To put this into context, by the time the Detroit Lions became an NFL franchise, Ty Cobb had already finished his Hall of Fame career with the Tigers. Spring Training games are a living example of these connections. Attend any game and you will see fathers and sons (and daughters) playing catch on the outfield berm between innings. You will sit next to kids not big enough to fill their seats (and not interested in sitting). You will talk to older folks with stories about games of yesteryear. Third, Spring Training is really about the process and the experience. For the players on the cusp, Spring Training can be an intense time. It’s a make or break for players looking to land a spot on the 25 man roster. For fans, it’s a much different experience. The fans are relaxed, just enjoying seeing how their players are performing. Will they get to see their stars in the lineup that day? Who will be a breakout player(s) who earns a spot on the roster? How are the top prospects performing and how far are they away from their big league debut? 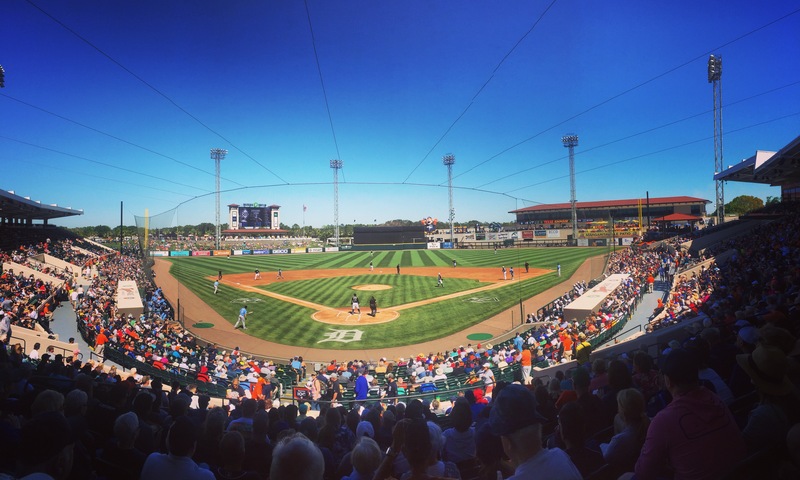 Spring Training offers fans the opportunity to reflect on the past season, discuss the off-season moves and speculate on the season ahead. Finally, Spring Training represents all what we love about the game. Like Opening Day, the All-Star Game, the start of the postseason and the World Series, Spring Training remains a comforting fixture on every fans calendar. We all know that feeling we get each Winter when we hear pitchers and catchers are reporting. There is cause for hope and optimism about the months that lie ahead. It’s about the smell of hot dogs, beer and peanuts; the sound of a ball popping in a glove and the crack of the bat; and the brightness of the March sun in Florida and Arizona. Baseball, more than any other game, is woven in the cultural fabric of America. Baseball about the rituals, the history, the commitment to our teams and the patience to see them through a long season. This week, as we will say goodbye to Spring Training and hello to Opening Day, take the time this season, not just to fret over the standings and statistics, but to enjoy the process. ← Previous Story Boone Bats Aaron Judge Lead Off – Really?